District Court Jalpaiguri Has Released Recruitment Notification For 17 Stenographer, Process Server, Clerk Posts. All Eligible & Interested Candidates Can Apply Online.Further Detailed Information Regarding Educational Qualifications, Age Limit, Selection Procedure, Exam Pattern, Syllabus for District Court Jalpaiguri Recruitment 2017 - 17 Stenographer, Process Server, Clerk Post is mentioned below. Candidates age should be between 18 to 40 Years As on 01-01-2017. Candidates should have done 8th / 10th / Diploma or its equivalent qualification from A recognized university. All Eligible Candidates will Be Selected Based on Their Performance In Written Exam, Skill Test/Inter-view . Rs. 7100 - 37,600/- With 3900/- Grade Pay (Post 1), Rs. 5400 - 25,200/- With 2600/2300/- Grade Pay (Post 2,6,7), Rs. 4900 - 16,200/- With 1700/- Grade Pay (Post 3-5) . All Eligible & Interested candidate fill the on-line application through official website (http://ecourts.gov.in/jalpaiguri). before / (11th July 2017). Opening Date of Application Form Is - 12-06-2017. Online Registration of Application Form Ends On - 11-07-2017. 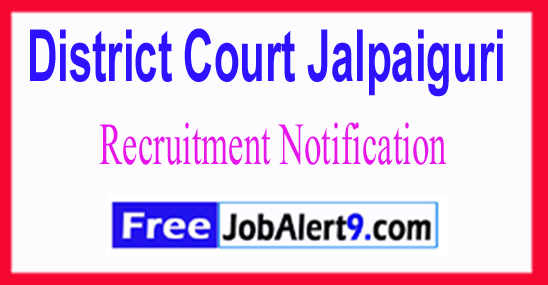 Click Here For District Court Jalpaiguri Recruitment 2017,Advertisement.